How’s your piggy bank, aka your savings account, feeling these days – heavy and healthy, or skinny and empty? Countless Canadians all but ignored saving during the past decade’s low interest rates. Borrowing was cheap and easy, which pushed personal debt levels to record highs. Along with low interest rates to borrow money came low interest rates on investments and savings. What started as an economic downturn drew out into a tumultuous time of uncertainty. While uncertainty can be stressful, it can also lead to change. One way we mark change is by making resolutions. 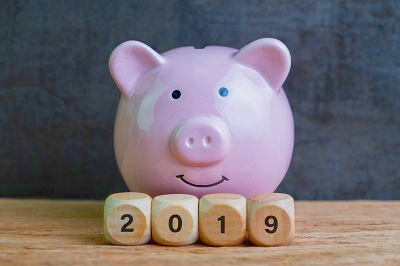 If you missed making savings goals part of your New Year’s resolutions on January 1st, or your best laid plans have already derailed, Lunar New Year is right around the corner and gives you another “official” chance to make positive financial resolutions for 2019. Red is a lucky colour in Chinese tradition, and many believe it to be a line of defense against bad luck. While this might be true when it comes to your home, your love life, your work, or good fortune, it’s best to keep your finances out of the red and in the black. Do this by paying down your debt as quickly as possible. Being in debt is expensive. It means that you pay more than the ticket price on everything you buy. The extra money it takes to pay ongoing interest charges and fees keeps you in a perpetual cycle of using money you earn today to pay for things you bought in the past. And continually paying for the past robs you of the ability to plan and save for future needs, wants, and goals. Taboos go hand-in-hand with traditions, and when they’ve been around long enough, the lines tend to blur. The top savings taboo to bust so that you can fatten up your piggy bank is to make savings intentional. Having money to put into your RRSP, TFSA, or any other savings account doesn’t happen by accident. You need to plan the money for savings into your budget, in the same way you budget for your cell phone bill or car payment. Think about it this way – saving money when you can afford it, or when you have some extra cash, almost never happens. That is why many a piggy bank is permanently on life support. The fix? Start saving right now. Check your bank balance, pockets, or wallet and find $10 or $20 to get yourself started. Put the money into your savings account. If you want to save for something specific, open a special savings account for just that one goal. If you save your small change, nickel and dime yourself to fatten up your piggy bank. Start small and plan into your budget how you can add more. Banking on luck is risky; be wise, create your own good fortune. Is Winning the Lottery Part of Your Financial Plan? Countless preparations take place for Chinese New Year. The tradition of sweeping the old year and any bad luck out of your home can be applied to your finances as well. We all have habits when it comes to our money, sweeping a little spending or debt under the rug more often than we care to admit. Think about any daily habits that add up over time, e.g. buying coffees and lunches out, rather than brown-bagging it at least 50% of the time. Everyone needs to check their utility and ongoing bills annually to see if what they’re paying for matches their usage, or if a better deal is available. For some, their habits have formed dependencies that end up costing them dearly, e.g. smoking or substance use. While others pay to play and their gaming turns to gambling. Once a year, shine a bright light into the dark corners of your budget. Sweep out anything old or unwise that no longer needs to be there. Give yourself a fresh start and focus on using your money and means to get closer to, rather than further away from, your goals. Engaging in smart money habits will help your little piggy bank mature. Breaking things is generally frowned upon, especially during Chinese New Year, but when it comes to your budget, does it sometimes feel like it’s broken beyond repair? When you’re living pay cheque to pay cheque, struggling to make ends meet, not daring to smash open your piggy bank because you know there’s nothing in it, it really can feel like your budget is broken. But don’t despair. Budgets can be fixed. They can be totally re-written, adjusted, tweaked, and tweaked again. Think of your budget as a plan for how you spend your money. It means taking a step back, looking at where your money is going right now, deciding where you want it to go instead, and mapping out your income to match. A budget is what will get your piggy bank off life support and help you save towards your goals. Pigs are a symbol of wealth in Chinese culture; a fat piggy bank, aka savings account, the same in many Western cultures. One of the best ways to fatten up your savings account is to automate your deposits. To do this, determine how much of each pay cheque should go into your savings account. Then set up an automatic transfer through your online banking to move money to your savings account on pay day. Money that’s out of sight, is out of mind – you’ll be surprised how quickly it adds up. The other super trick to make saving easier is to give yourself a little lucky money every time you get paid. Whether you call it an allowance, crazy cash, mad money, or whatever, it is cash that you can spend any way you like. Or set aside towards something a little bigger. The money is your reward for sticking to your budget and spending plan. Chinese New Year is celebrated all around the world. Enjoy the festivities and celebrations to ring in the Year of the Pig!